Rosa ‘White Pet’ is one of the oldest polyantha roses but also still one of the most popular ones due to its sheer excellence! 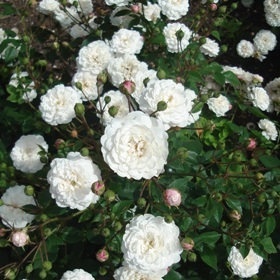 This rose produces sprays of rosette-shaped, double white flowers from red buds which contrast nicely with its deep green leaves. Polyantha roses are the predecessors of the modern floribundas and share their characteristic of producing large clusters of small flowers more or less continuously all season. The plants are compact and best grouped together for impact. As a polyantha rose, it should be pruned from late winter to early spring by cutting back the main stems to 25-45cm above the ground pruning to just above an outward-facing bud. In addition sideshoots should be reduced to two or three buds and any spindly or diseased growth should be removed. To encourage young, vigorous growth, a third of the oldest stems should be cut back almost to their base every year.